Lifting of Ontario Hydro Turbine Shafts - Unirope Ltd.
Twin-Path® slings are regularly used to lift turbine shafts and other components. 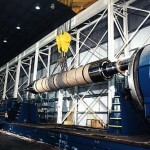 These pictures show a 155 ton turbine shaft being lifted out of a large lathe. Note that the highly polished shaft surface does not need expensive and time consuming wood padding but only a layer of craft paper for lifting. Twin-Path® slings do not scratch or mar surfaces. Twin-Path® slings are light and superstrong. Rigging of these slings is performed in a fraction of the time it would take this crew with wire rope slings. One man (!) 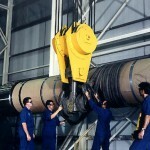 can handle slings with a WLL of more than 100 tons ! That would be the equivalent of a 5″ diameter braided wire rope sling. Just ask your riggers what THEY would prefer.